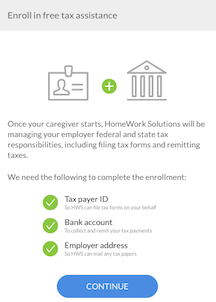 In order to proceed with hiring a caregiver you will need to opt-in or opt-out of tax management. Follow the steps below to set up your tax management. 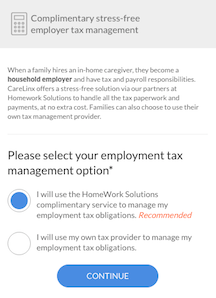 Tip 💡: This service is included in the CareLinx fee and we strongly recommend you use it to help manage your employment tax obligations. If you select to use your own tax management you can resume with the hiring process. If you choose to use it, continue to follow the steps below. 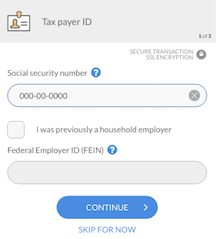 Tip 💡: Your SSN is securely encrypted and will only be used by HWS for the purpose of tax filings. 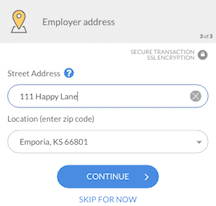 If you were previously a household employer, we will need your Federal Employer ID to file your employment tax. 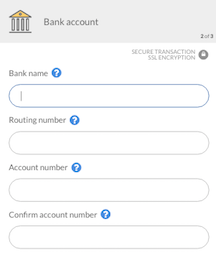 Type in the information of the bank account you wish to use to pay your taxes. This is where the taxes will be sent. After you click 'CONTINUE', you will be enrolled for HWS tax management services and can continue with the hiring process.